"Blazing . . . casts a spell right from the start." --Dwight Garner, The New York Times"An extraordinary book." --Lauren Groff, author of FloridaIlluminating one of the great love stories of the twentieth century - Tennessee Williams and his longtime partner Frank Merlo - Leading Men is a glittering novel of desire and ambition, set against the glamorous literary circles of 1950s ItalyIn July of 1953, at a glittering party thrown by Truman Capote in Portofino, Italy, Tennessee Williams and his longtime lover Frank Merlo meet Anja Blomgren, a mysteriously taciturn young Swedish beauty and aspiring actress. Their encounter will go on to alter all of their lives.Ten years later, Frank revisits the tempestuous events of that fateful summer from his deathbed in Manhattan, where he waits anxiously for Tennessee to visit him one final time. Anja, now legendary film icon Anja Bloom, lives as a recluse in the present-day U.S., until a young man connected to the events of 1953 lures her reluctantly back into the spotlight after he discovers she possesses the only surviving copy of Williams's final play. What keeps two people together and what breaks them apart? Can we save someone else if we can't save ourselves? Like The Master and The Hours, Leading Men seamlessly weaves fact and fiction to navigate the tensions between public figures and their private lives. In an ultimately heartbreaking story about the burdens of fame and the complex negotiations of life in the shadows of greatness, Castellani creates an unforgettable leading lady in Anja Bloom and reveals the hidden machinery of one of the great literary love stories of the twentieth-century. In its construction, Leading Men is as intricately designed as a Lego kit. The pieces from which the novel is built snap together into a whole so redoubtably sound that by the time I finished reading it I almost believed John Horne Burns really had met Tennessee Williams in Portofino, that Anja Bloom really existed and that Call It Joy really was written by Williams rather than cannibalized from a flawed short story left over from Castellani's days as an M.F.A. student. Engineering may be the aspect of novel writing that deserves the most praise and gets the least, and Castellani is a first-rate engineer. At its best, his novel not only exults in the historical synchronicities and proximities he has discovered but catches the reader up in its rapture. I only wish he had been bold enough to go further. Instead, as if abashed by the shadow Williams casts over him, too often he undermines his own inventions, withdrawing into excesses of explanation, banal writing and self-contradiction just when he ought to go for broke.... More problematically, when the time comes to carry through on his boldest inventions, the Testa del Lupo episode and Call It Joy, Castellani lets Williams get the better of him.... A worse misstep, I think, is his decision to incorporate Call It Joy into the novel, only to have his characters trash it.... If Williams haunts Leading Men, it's not as its guiding spirit but as its guilty conscience. Castellani's quiet portrait of Merlo has a deep, aching appeal, and while his invented story of Anja's legendary career and reclusive later years has its moments, it doesn't match the passages where he plunges directly into the give-and-take of Merlo and Williams's loving if volatile relationship. 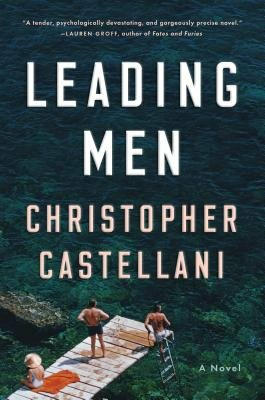 Castellani's prose has a beguiling lilt and color... Leading Men has shrewd things to say about the ways that love between two men hazily defined itself 60-odd years ago... Leading Men doesn't deliver answers  but it's seductive in the way it raises its questions. Writing fiction is to no small degree a confidence game, and "Leading Men" casts a spell right from the start.... This writer's scenes glitter, and they have a strong sexual pulse.... "Leading Men" is largely told from the perspective of 10 years after its opening scene, when Merlo is dying from lung cancer in Manhattan and hoping Williams will visit. The book wraps a second, slightly less successful story around this first one.... "Leading Men" has a few dead nodes in it and the subplot, involving the reclusive actress and a production of Williams's final play, generates fewer sparks than does the account of Williams and Merlo's dazzled propinquity. But this is an alert, serious, sweeping novel. To hold it in your hands is like holding, to crib a line from Castellani, a front-row opera ticket.